residents of the coastal port town of Koko in mid-western Nigeria are complaining of strange deaths and illnesses which, they suspect, have resulted from the poisonous chemicals that were secretly shipped to the port as part of 3,500 tonnes of toxic waste about 10 years ago. The radioactive waste including polychlorinated biphenyls (pcbs), methyl melamine, dimethyl, and ethlacetate formaldehyde were brought in five shipments to Koko between May 1987 and April 1988 by Gianfranco Raeffeli, an Italian businessman, and falsely presented to port officials as material "related to the building-trade". They were kept for a monthly fee of us $50 in the back of the bungalow of Sunday Nana, a Koko native who died of tuberculosis and cancer of the throat two years later. His death was suspected to have been as a result of drinking water from containers earlier used to keep the waste. The whereabouts of the clandestine cargo came into the open when some Nigerian students in Italy stumbled on some Nigerian press reports. 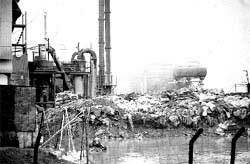 The outrage which followed the discovery led to the establishment of the Federal Environmental Protection Agency (fepa) in Nigeria which supervised the evacuation of the toxic waste back to Italy. Victor Nana, a wealthy local farmer who is also the town's official spokesperson, has plenty of reasons to be worried about the long term effects of radiation resulting from the Koko toxic waste saga. Two of his relatives, a sister and a brother, are suffering from illnesses doctors have not been able to diagnose or cure. "It doesn't seem that doctors know the nature of my sister's illness," he laments. "She is emaciating all the time. She has been tested for tuberculosis twice. The result was negative. She was also treated for all known causes but she is not responding to treatment. There is also my elder brother who had a stroke about four years ago. I have been taking him from one hospital to the other." Like Nana's, other families in the town are reporting with sick relatives whose ailments have confounded them. They are likely to have developed diseases from the effects of the toxic waste since some of them took part in its transportation in 1988. Some of them had to be hospitalised at that time for problems such as severe burns due to chemicals, nausea, partial paralysis, and blood-stained vomit. At least one of them went into a coma. The quality of protective clothing given to them during the transportation was said to be defective. It has been reported that some of them were not even given gloves. A visit to Nana's house reveals nothing unusual. The tenants in the house refuse to speak either on their health conditions or their fear. Only Tony Rhogho, a photographer who once lived in the house for four years after the toxic waste incident is ready to speak. "I knew that toxic waste was kept in the compound of the house before I rented it," he says. "I felt that there was nothing to fear after experts from abroad had been to the house to neutralise the effects of the toxic waste. They dug the ground six feet, removed the sand and replaced it with fresh sand. So I felt nothing else remained and I have never had any unusual ailments." However, people of Koko are unhappy because the government did not keep its promise to set up a radiation monitoring unit in the town to monitor the long-term effects of the chemicals on their health and environment. Their fear stems from the fact that scientists have identified the types of toxic waste dumped in Koko as capable of causing cancer, pre-natal disorders, asthma, bronchitis, and other respiratory illnesses. "We were told at the time that the effects of radiation might be immediate or it might take many years to become manifest," Nana recalls. "It was a wise decision that the government took at that time to set up a monitoring unit. I am very disappointed that it wasn't set up. If anything happens to those of us who were here at the time, there is no means of knowing." Adegoke Adegoroye, chief executive of fepa , gives Koko a clean cheat on health, saying there is no threat either to the health of the people or the environment from the toxic waste. He said that "a post-impact study" carried out in Koko showed that plants such as pineapple and beans in the area were safe for human consumption. He added that the study which included a soil test showed that no residues of the waste remained in Koko. Adegoroye refers to the removal of the toxic waste back to Italy as well as the decontamination exercise carried out in Koko by a team of international experts during which a large chunk of the soil in the area was removed. "For about three years, experts from abroad in conjunction with Nigerian scientists closely monitored the situation in Koko," says a top fepa official on the condition of anonymity. "If they didn't find anything then, I dont think they will find anything now." It can be easily concluded that fepa considers the Koko case closed. But is fepa 's position right? "I really don't know," says S O Ogbemi, the physician in charge of Koko General Hospital in the late 1980s when the toxic waste scandal broke out. "All I know is that there were effects of toxic waste on the health of some people at the time of the incident and they were reflected in the records," he says. "There were people who coughed out blood. There were people who vomitted and the vomit was blood-stained. They were admitted to the hospital and some were referred to bigger hospitals. So there is an evidence. He says there is a need for systematic monitoring of the town's environment and the health of its people. "A radiation monitoring unit is still needed in Koko," he advises. "The fact that government has not done that up till now does not reduce its importance." Nana agrees, adding that the worst part is having to contend with fear of the unknown. "We may live in fear till the end of our lives," he says. "Some of us who are old always fear that something is wrong with us. May be I should be more agile at this age. Maybe we are ageing much faster. We do not know. A scientific monitoring of the health of the people would have given the answer quite easily. It is not too late for the government to do something about it and we will be glad if it happens." Ogbemi and Victor Nana find a supporter in Dipo Adekanmbi, an environmental scientist who worked with fepa before moving to a multi-national oil company. He said he was shocked to learn that the agency does not have a radiation monitoring unit in Koko. "It is as if we do not understand the grave effects of toxic waste and radiation in this country," he says angrily. This may not as yet prove as grievous as Bhopal or Chernobyl, but judging from the apprehensions of locals, it is obvious that fepa will need to do more than it has done to assure the people that they have nothing to worry about.